In March, Sega announced that their upcoming MMORPG, Phantasy Star Online 2 will be smart phone compatible and free to play. In a recent interview with Weekly Famitsu, Phantasy Star series producer, Satoshi Sakai, talked about Sega's somewhat ballsy decision. 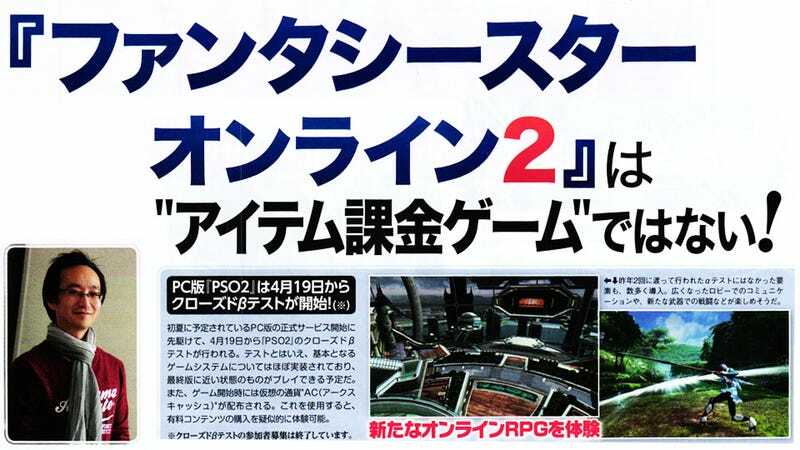 Apparently, the decision to make Phantasy Star Online 2 free to play came about very early in the game's production. With the increase of free to play online social games for smart phones, the developers were worried that the public perception of online games was becoming distorted. Most free to play online games are made so that the game's full potential cannot be tapped without some monetary investment. The developers at Sega found this trend of game development that favored players who would/could pay over players who wouldn't/couldn't to be troubling and unfavorable to the game market at a whole. Said Sakai, "By allowing a well made game like PSO to be accessible more people, we felt that we had a chance to teach people that 'This is what online RPGs are supposed to be like.'". While Phantasy Star Online 2 does have some features that can be bought with money, the developers have restricted these to minor, non-essential areas, like upgrades for players' individual rooms, increased storage space, or trading features. "There is nothing that requires payment that will take away from the intrinsic game experience if they are not purchased." Sakai explained. Sega has always been a game developer that mixes up the pot, and while not every attempt has been successful (some, like the Dreamcast, being ahead of their time), more often than not, they manage to leave their mark. With Phantasy Star Online 2, Sega is seeking to change the online game market itself. "We are seeking to create a business model that functions while still allowing PSO2 to remain as much of an enjoyable experience as possible." Sakai spoke, reflecting on the online gaming market. "I honestly think that Sega is the only maker that is willing to go this far. Even if we fail, if we can get people to say 'They were 5 years ahead of their time' then I'll have no regrets. I believe that there's meaning in the challenge itself." Phantasy Star Online 2 is currently in closed beta testing, and looks absolutely beautiful.